Whale watching in Tofino is the best location in the world for taking in the breathtaking sights to witness these gentle giants up close. 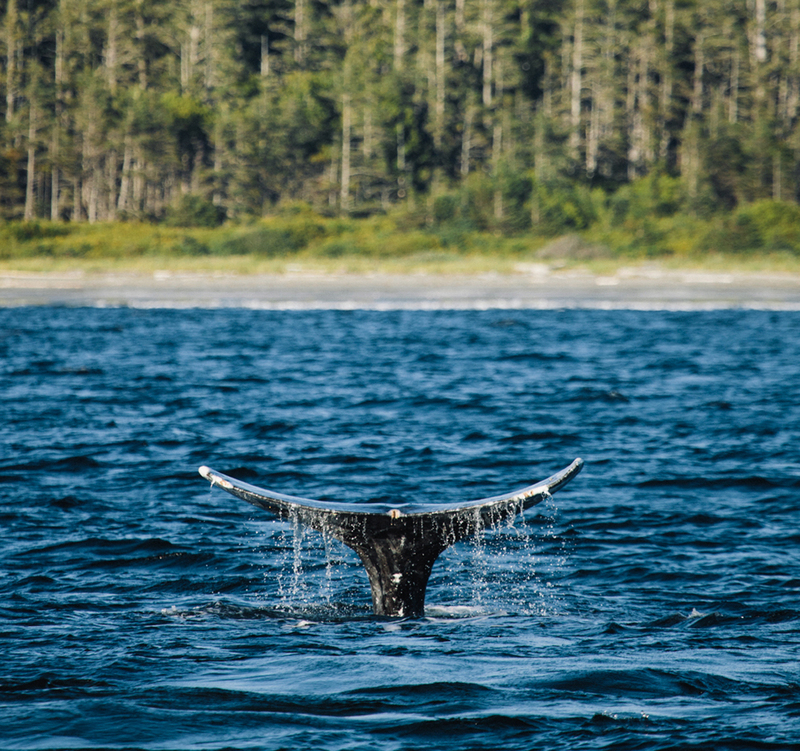 British Columbia’s west coast is known for whales and sea life, but Tofino is especially known for whale watching as it’s part of the migratory path for several types of whales. Much of the west coast area along Vancouver Island is uninhabited and only accessible by boat or floatplane, which makes for pristine wilderness, beautiful rainforests, and great whale watching adventures. Each spring over 20,000 Gray whales swim past the west coast of Tofino, migrating from their birth waters in the Baja Peninsula on their journey north towards the Bering, Chukchi and western Beaufort Seas to repeat their birthing and mating cycle. There are over 200 ‘resident’ Gray whales that stay in the area between April to November. Some of the resident whales are well known to locals, like Two Dot Star and Saddle, which have been seen regularly since the 1970’s. These majestic ocean goliaths are most often seen in the Tofino waters during the summer, providing visitors ample opportunity to enjoy whale watching. Gray whales will often breach, or leap out of the water, but this activity is more common with Humpback whales, also frequent visitors to the Clayoquot sound. The Humpback whales are the largest visitors, known to migrate to Tofino from Hawaii and Mexico, and the most frequent sightings occur between June and September. The breaches and tail slapping of the Humpback whale are a spectacular sight. Preparing for the winter months ahead, the Humpbacks need to build up their fat supply and consume as much as 2 tonnes of crustaceans, plankton and small fish per day. Possibly more impressive than their playfulness is what some call the Whale Song. This occurs when Humpback whales force air through their massive nasal cavities, similar to other marine mammals like porpoises, often during the mating season and believed to be related to the purpose of aiding selection in a mate . Sightings of Transient Orcas are common around Vancouver Island, with many resident orcas traveling in pods throughout Tofino and Clayoquot Sound in their hunt for food. Orcas typically travel together most of the time, with the possible exception of when foraging or mating. Known for being very social, they can often be seen intermingling with pods from other clans. They also tend to get very vocal when a new group arrives, leading to lots of tail slaps, breaching and spy-hopping, where the head is completely out of the water. Also known as Killer Whales, the largest on record was over 32 feet and weighing over 10 tonnes. When whale watching the orca, males are easily spotted by their larger pectoral fins, and the dorsal fin is about twice the size of a females. 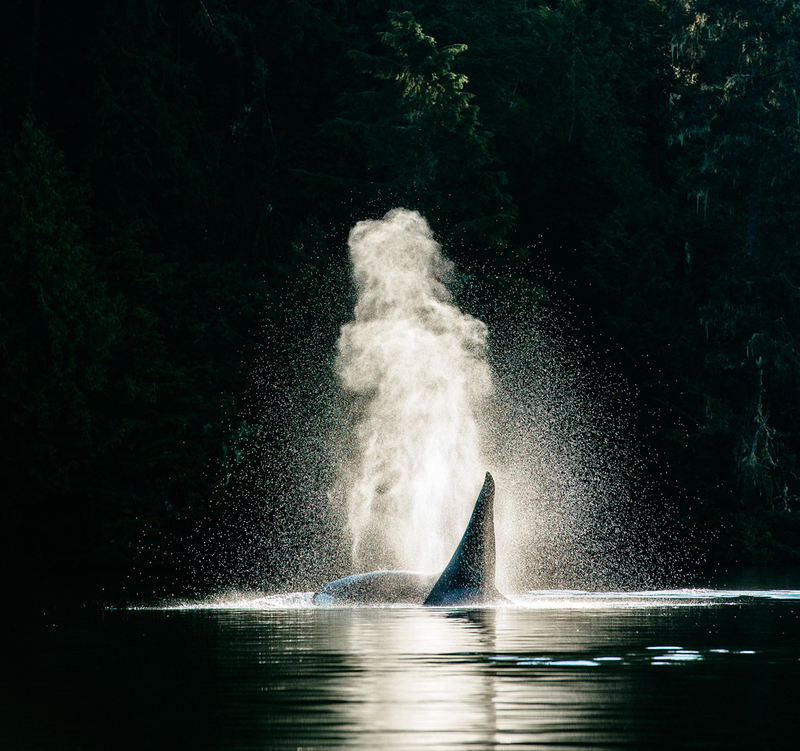 Many First Nations hold orcas with high esteem in their stories and art. The sightings of the orca are usually random and not always spotted on a whale watching tour. Other wildlife is often seen on an ocean safari or whale watching tours along the coast of the pacific ocean, and can include black bears, sea lions, dolphins, seals, sea otters, along with a variety of birds like eagles, heron, cormorants and puffins. When going out on whale watching tours in Tofino, the temperature on the water usually drops several degrees and it’s advised that you wear several layers of clothing during your trip. A waterproof layer on top is also advised, along with sunglasses, sunscreen and your camera to make your experience more enjoyable. The average whale watching tour is at least a couple hours, so be sure to dress warm. Tours for whale watching usually take place on a zodiac, private charter or larger boat like a cabin cruiser. Be sure to visit our Adventure Centre for info and read Things To Do in Tofino.